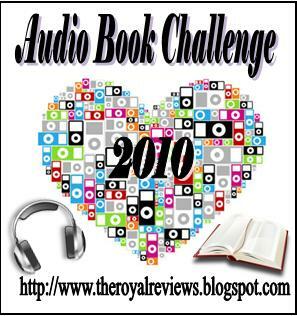 I am participating in the 2010 Global Reading Challenge and am choosing books by new-to-me authors to add a bit of extra spice to the challenge. 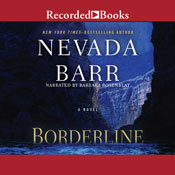 I’m also looking for books that will allow me to lose myself in their exotic locations so, having always meant to try Nevada Barr’s Anna Pigeon series which I’ve heard has particularly strong settings, I picked out the audio version of the most recently published volume for this challenge. Borderline, the 15th instalment of its series, opens with Anna Pigeon, a Ranger with the US National Parks Service, suffering from post traumatic stress disorder due to an incident in which she killed someone. As part of her self-prescribed treatment she and her husband Paul take a rafting trek down the Rio Grande in Big Bend National Park, Texas. Their tour group, four college students and a guide in addition to the couple, stumble upon a near-dead pregnant woman who, they think, was probably crossing the river from Mexico so her baby could be born in America. Happily I was not disappointed in my search for a book with a strong sense of place. The physical grandeur of the Rio Grande and its surroundings is quite spectacularly brought to life by Barr and I felt as if I was travelling in the raft, staring up at the canyon walls and keeping a wary eye out for flash floods. But the book also has a wider sense of its location on the border between the US and Mexico: a place of racial tension where the politics surrounding illegal immigration into the US is most keenly observed. Although the book did take a side on this hot button political issue it did so sensitively and as a natural part of the story which I found a refreshing change from being preached at which has happened several times in my recent reading. The other aspect of Borderline I found quite captivating was the depth of the characterisations. I knew nothing about Anna Pigeon heading into the story but I felt enough information was provided to give me a sense of her history. The depiction of her coming to terms with the shooting incident, her status as a ‘mere’ woman rather than a ranger, her relatively new marriage after many years of independence and her decision never to have children were played out against the backdrop of danger and adventure that Pigeon seems to thrive on. Another self-aware character was Darden White, the 63-year-old head of security for the Mayor of Huston who is in the Park to announce her run for Governor of Texas. White queries his own abilities as he ages as well as his devotion to the Mayor, who he used to babysit when she was a child, and Even the teenage ,products of the Barney generation, are quite thoroughly fleshed out and easily become people I wanted to read more about. My one slight disappointment with the book is that in parts there was only a cursory attention to plot, especially in the second half which takes place after the rafting group leaves the river. It is revealed rather clumsily that the pregnant woman in the river was the victim of a crime but ultimately the culprit reveals themselves rather than being uncovered through any sleuthing, professional or otherwise, and the ending includes a disappointing thriller-style car chase that is at odds with the sensitivity shown earlier. Overall though I enjoyed meeting Anna Pigeon and loved spending a few hours in a spectacular part of the world I have not (yet) visited. To top it off Barbara Rosenblat’s narration was delightful, capturing the wry, slightly cynical tone that perfectly matched the picture of Pigeon depicted in the story told from her point of view. I couldn’t find a review that didn’t give away more of the plot than I would have wanted to know heading in to the story so I’m not linking to any of them. 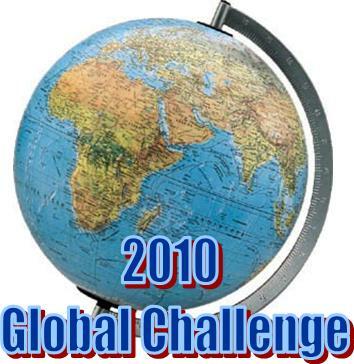 This entry was posted in book review, Global Reading Challenge 2010, Nevada Barr, USA. Bookmark the permalink. Bernadette – Thanks, as always, for this fine review. I, too, really enjoy novels with a strong sense of place. That’s what I like about Margaret Coel and Tony Hillerman, Donna Leon and Martin Edwards. I’ve never read an Anna Pigeon book but the series has been on my list for a while now. Thanks for the review. And reading it, I just realized that my kids are the teenage products of the Barney generation – never thought about it like that before!